iCollector has it. eBay has it. And now Proxibid has it, the ability to enlarge thumbnails merely by sliding the mouse over the photo. This is a great technology for coins, because die varieties need close inspection. One glitch seems to be hovering over the photo, liking what you see and then trying to click to expand the whole shebang. In the first few seconds, the program doesn’t know what you want to do–magnify the thumbnail or go to expanded version. Eventually it decides on the expanded version because a click trumps a mouseover in the tech world. But that’s a small price to pay for the innovation. Now we need auctioneers to upgrade their photography so that images are sharp and expandable, showing both sides of the coin. In the online trade, photography is everything. We continue to encourage Proxibid to award a badge for photography. And we continue to love “Proxibid Live.” This new tech feature is part of an eventual revamp that began with Proxibid’s redesign. We applaud that kind of continuous improvement! 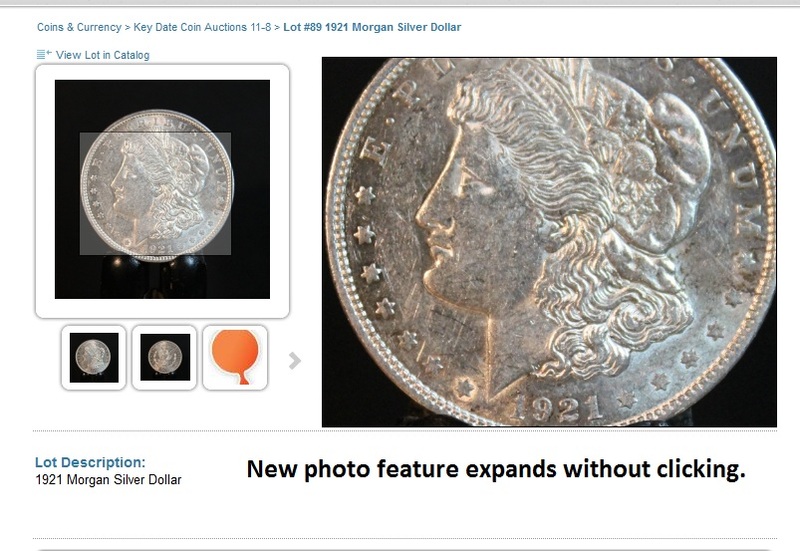 This entry was posted in News and tagged American Numismatic Association, Auctioneers, AuctionZip, Best Practices, Coin Auction, coin photography, digital photography, eBay, iCollector, National Auctioneer Association, Proxibid, Proxiblog. Bookmark the permalink.